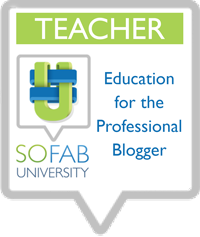 Essio sent me a Starter Kit for feature here during Blog POP! 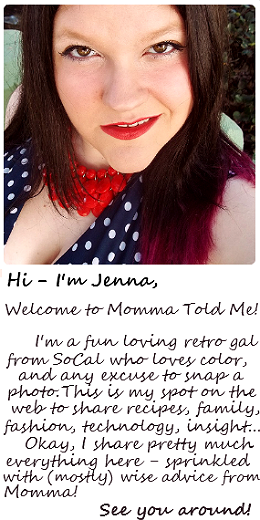 School Rules, all photos and opinions below are authentic and property Momma Told Me Blog 2014. Momma Told Me: Sometimes it takes all the senses to truly unwind. Last year, for my birthday, I received a SpaFinder gift card intended to book my very first full body massage. Spending days at the salon, relaxing in Palm Springs, and getting spa treatments are the norm for Momma's half of the family; but I haven't been accustomed to that lifestyle. Allowing myself to relax, in general, was far more disarming than disrobing and laying on top of the table. As it turns out, one of the things that worked best for me was the use of essential oil diffusers and candlelight, that helped ignite and shut off key senses and impulses. As bergamot and lavender wafted through the air my limbs became relaxed and I was able to key in on physical feelings above emotional stresses and trauma. It was worth every penny- but hardly something I could recreate every day. 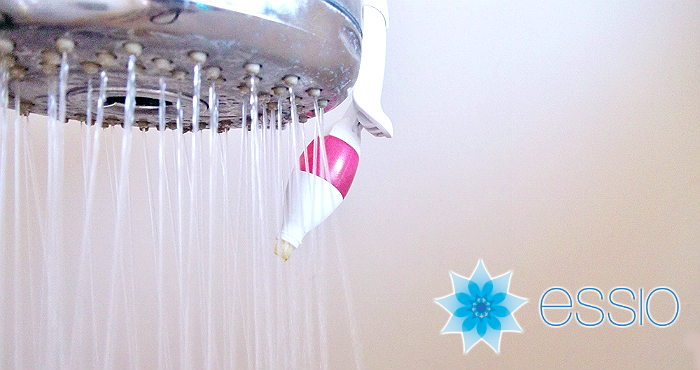 When I learned there was an aromatherapy system for the shower I was immediately intrigued. For me, the shower is somewhat of a sanctuary, it's the only place where I can turn everything off and focus on me. Whether it's shaving my legs, or simply letting the warm water gently massage my muscles as I stand under the radiating flow. Most days I shower in the morning, to clear my mind for the day and rejuvenate, some days I take a second shower at night, in the dark to help calm my heightened senses from a stressful day. 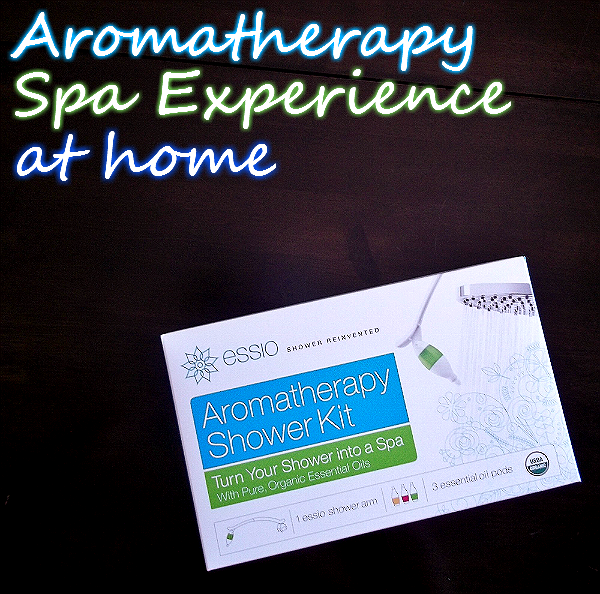 The Essio Aromatherpy Shower Kit works with your natural relaxation of showering to help enhance certain emotions and responses through essential oil diffusion. The concept is quite simple, really. 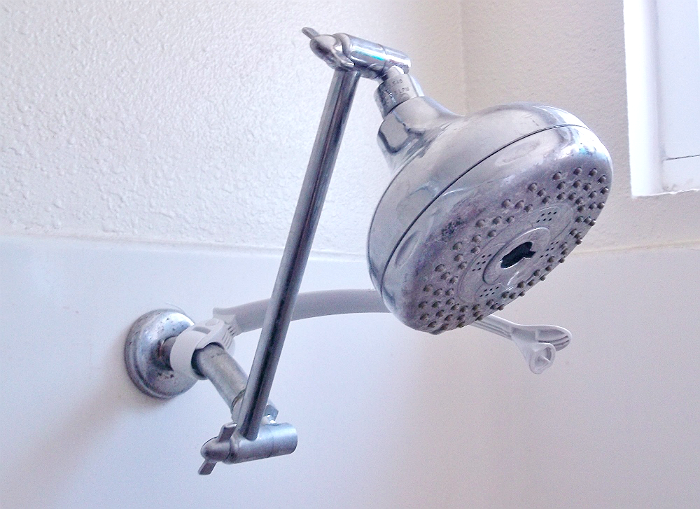 A relatively inconspicuous stand is mounted to the base of your shower head with simple snapping latch. The stand rotates 360 degrees, an extends to meet the height and flow of your water. Simple 'scent pods' attach to the nozzle at the very end and allow for a slow saturating diffuser to release fragrance beneath running water for an aromatic showering experience. The basic starter kit comes with 3 popular essential oil blends; Breathe (decongests and opens), Passion (awakens desire, and Unwind (Relieve Stress.) There are currently 6 pod blends in total, and they may be purchase in packs of 4 to 8. My experience was that Breathe certainly came off as the strongest blend, with a very strong presence of cedarwood, eucalyptus, and peppermint essential oils. Out of the three I noticed this one wafted out of the bathroom the most, and even made my lungs tingle a little breathing in the intense steam coming up off the shower stall. Because of this we learned the Essio pods do not always have to be directly under the flow of the water to provide n aromatherapy experience. For hot showers the resulting steam is more than enough to encourage activation of the diffuser. 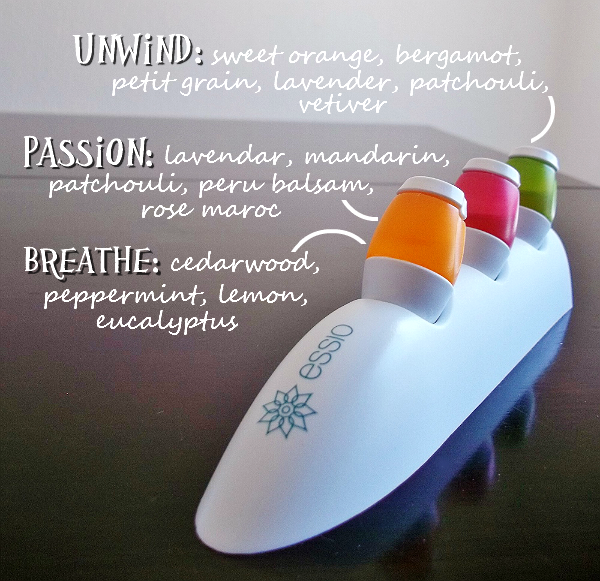 My personal favorite, and the more mellow of the starter kit pods, was Unwind, featuring Sweet Orange, Lavender, bergamot and vertiver. I found just a burst of this beneath my water in the evenings helped wash away all of the stress and tension of the day. I was also happy to note, while the fragrance lingers in the atmosphere, it does not adhere to one's skin- so the experience is kept as more of a contained spa shower treatment than all day effect. 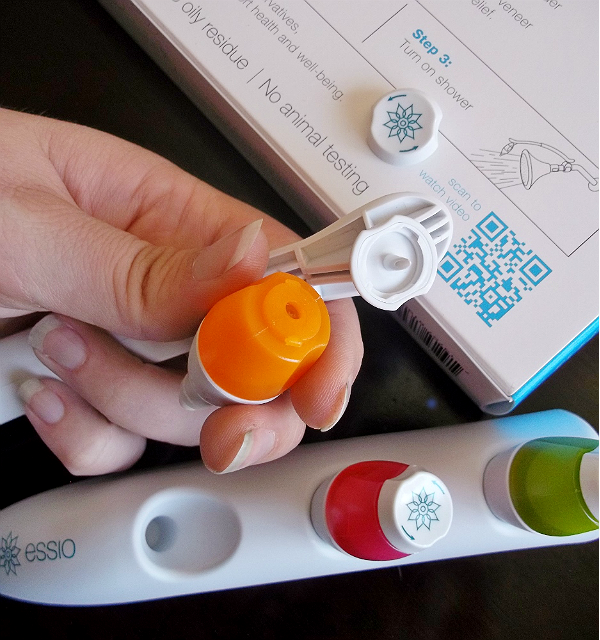 In all, we have been very happy with the results of our Essio experience and I have already been asked when we will be ordering more pods! How do you unwind with fragrance at home? Have you used essential oils? 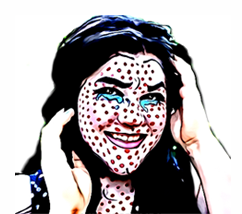 What Daughter Says: Take advantage of your guard being down and experience shower aromatherapy. 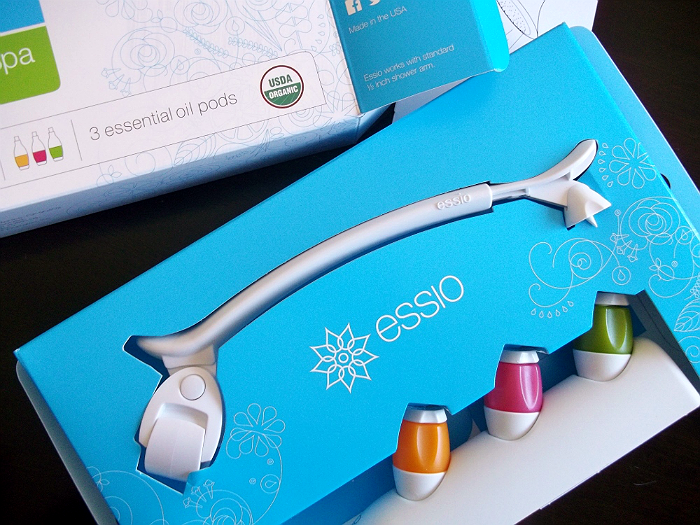 One Momma Told Me reader will win an Essio starter kit! Clear sounds like a good choice for finals week - or maybe wisdom would be better? I would like to experience Unwind the most. I like the idea of relieving stress and allowing the body to unwind so that your sprit and mind reunite. Unwind would be perfect after a long day of work. This system looks great and easy to use! This is seriously cool. It is amazing to me how much a scent can change my feelings and mood. I think the Wisdom would be my favorite. I have never seen anything like this before! Sounds very spa like! I want to try and sneak the Passion into my husbands shower - LOL - and my son need the Breathe right now while he has a head cold. I am thinking Clear for myself. very cool, this is something I truly need! It takes a GC and a sitter to get me to the spa these days, I know how hard it is as a parent. THIS? I'd indulge all the time! This is so cool! I love that it works in a shower instead of a bath, I am more of a shower person. I have never tried anything like this with the essential oils. I could use the oil that helps you breath better. I always have essential oils in our diffuser. They really help me relax. I am a shower person, and I can't afford spas often, so I think this would be perfect for me. This baby is calling my name. With all of my recent health issues and family life I've been stressed beyond belief. This kind of product is exactly what I need to relax every day! The Clear Pods would be awesome for the morning! Thanks for the awesome giveaway! Amy D.
Breathe and Unwind sounds fabulous! What a cool idea. I could definitely use some aromatherapy lately. Breathe and Unwind sounds perfect for me! 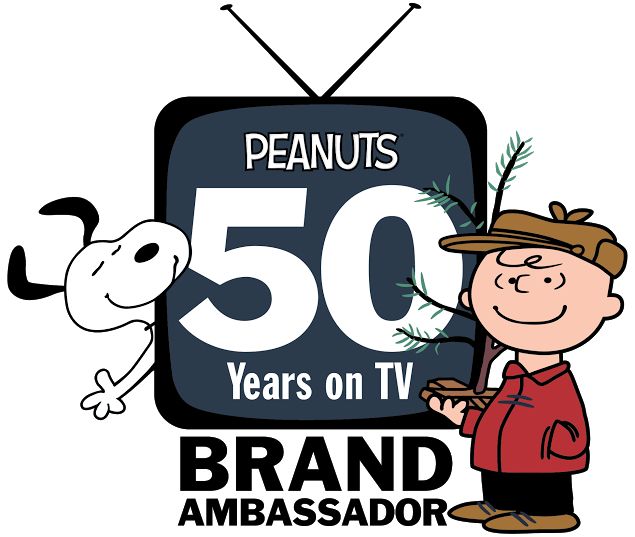 I had never heard of this before. I could definitely go for some down time and "unwind". It's hard to unwind, and or to allow myself to just chill and relax. Fun looking product(s). I will take the Passion please! hope I win, this is heaven! I am so in love with this! I love spa experiences! I had no idea they had cool shower pods like this!I want unwind! That looks amazing!!! I would love to unwind with that at the ed of the day! This would be perfect for my house!! I could use it and get all the wonderful smells and it wouldn't cause a problem for my husband who is allergic to strong scents of ANYTHING. This looks like an awesome way to escape... but never have to leave your home! So neat! I want one of these! The Unwind blend sounds wonderful and I sure could use it. I want one of these. It sounds easy to set up and use. A great addition to my bathroom. That's soo cool! What a great idea. Now that is a great invention!!! I love the look of the little pods too! Now this is really cool. Shower time is one of my favorite 10 minutes of the day. Would love to have this too! I love long baths with lovely scented products, but of course I don't always have time. This sounds like a great way to do some pampering in the shower! I'd love to try clear, as it seems like a great way to start the day. These look lovely. First I'd try their Breathe Pod Blend! Oh lovely indeed. 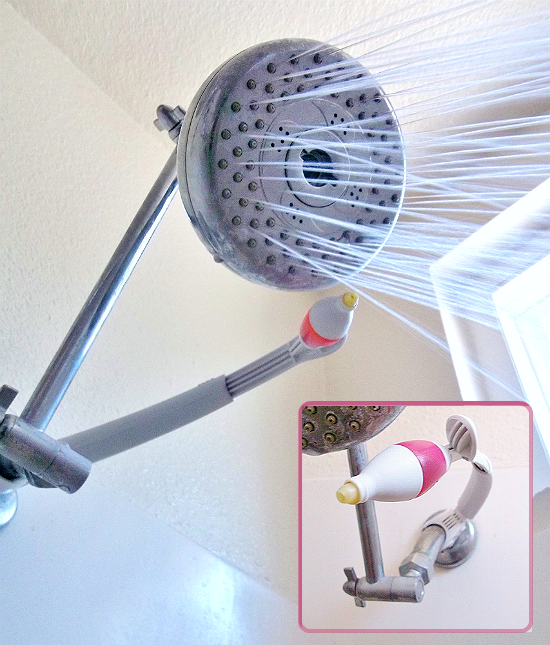 Great idea to do the shower!! I love essential oils! This is a neat tool to use them with. Pretty cool! We all need our things to help us relax! I've never heard of the products before. I'll have to check them out! I would like to try Night. The Passion blend sounds really nice and the Night blend sounds like it would be great for bedtime relaxation. I want to try the Night blend because I always shower at night. That would be a nice addition right before bed. Oooh I need a mix of all! LOL But probably Unwind or Night. I like to take a relaxing shower after work and/or before bed! Thanks for the giveaway! I would love to experience the Breathe Blend. I want to try them all but if I had to pick one I would pick passion! I would love to try Unwind! I would love to try Clear! I'd most like to try Wisdom. Thanks. I would love to try the Unwind blend. I would love to try the unwind pods!